Volunteers serving on the cider stall at last year’s beer and cider festival. 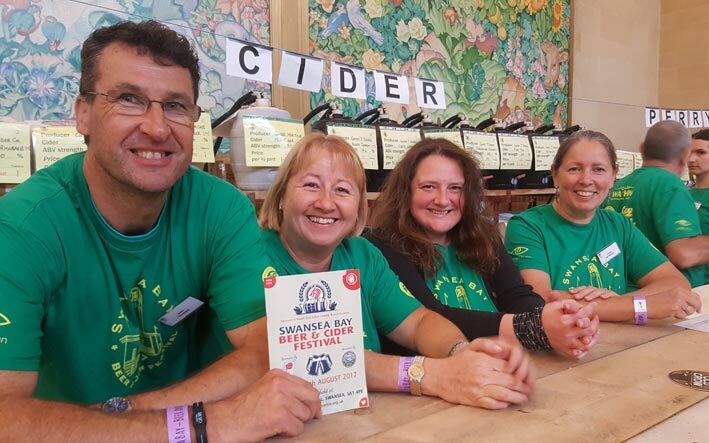 We have got 54 of the UK’s finest ciders and perries all lined up for you to try at the Swansea Bay Beer and Cider Festival from 23-25 August at the Brangwyn Hall. Oak whisky barrel matured cider from Welsh cider apples. WPCS Gold winner 2017. WPCS Gold winner 2018. Award winning sweet Welsh Cider, blend of Browns, Ellis bitter and Dabinett cider apples. WPCS Bronze winner 2018. Subtle blend of freshly prepared local cider apples. WPCS Silver winner 2018. Award winning cider blended from over 40 varieties of dessert, cooking and eating apples hand-picked by Benedictine monks. Crafted Herefordshire cider made using the best traditional methods with a contemporary twist. A medium, crisp cider bursting with real apple flavour and a fresh finish to excite the palate. A mix of Cox and Bramley with a touch of Red Gloss from the orchards of Oast Fruit Farm. Pressed on the last glorious sun-filled day of autumn, perhaps there’s a hint of that in the sweet tangy finish. Medium traditional farmhouse perry from locally sourced pears. Well bodied with a good flavour, a good apple that takes its time fermenting, making the cider late to mature. Sumptuous, succulent, full bodied. This cider now has quite a following amongst the most discerning cider drinkers and rightly so. It is rich and full bodied with a fresh fruity aroma. This warrior of a cider is sweet but mighty on flavour. The result is a cider with a full depth of colour and a mature yet smooth finish. It is a light straw coloured medium cider with a nice refreshing crispiness to it. Golden medium cider with a refreshing apple aroma. Smooth balanced flavour. Who can resist a light, bright, fruity glass of Happy Daze? It’s a smooth and fresh tasting cider which makes it easy drinking. An out of the ordinary blend of apple and pear juice blended to tantalise your taste buds. A mighty medium cider. Like a warrior, it is strong, powerful and proudly Welsh. This cider has good depth of colour and a rounded, balanced flavour. A pale, fruity perry with an aroma of fruit and a hint of honey on the palate, CAMRA’s 2013 silver award and Champion Perry of Britain 2015. Oak conditioned in Lowland whisky barrels. Special edition finished in sherry barrels. A sharp, very sweet cider with good apple flavour which is very popular on the festival circuit. A fruity medium cider with a pleasant appley sharpness balanced with a smooth sweetness. A dark in colour cider expressing a rich, complex taste with hints of caramel. Made from traditional bittersweet cider apples blended with black treacle prior to fermentation to give a rich cider with hints of caramel and pudding. Finished in oak to give mocha and vanilla notes. Deep dark colour and very full oaky body. A full bodied sweet cyder with a tannic bite. A medium dry strong cyder aged in American white oak Rioja barrels. It has oaky vanilla notes with hints of dark berries from the red wine and a spicy finish. Named after John Frost the Chartist who led a 10,000 strong march past the top of our street to liberate a fellow Chartist imprisoned at Westgate Hotel, Newport. Multi award winning farmhouse perry made with a single variety unknown Perry Pear found in Monnow Valley. It is naturally sweet with a very soft mouth feel and has hints of sugar barley and citrus fruit. Sweet, lively cider that blends traditional bittersweet apples with a contemporary Russett apple to make a light, refreshing quaffable cider. Dabinett and Michelin apples are blended here to present a very interesting medium cider. A strong appley character is pepped up with a touch of sweetness. A fruity medium perry with a complex yet balanced flavour made from Stinking Bishop Perry pears. Crisp, fresh, fruity and full bodied. Gilly is a seedling variety developed at East Malling research centre as an early ripening apple. It is bitter sharp with floral flavours and crisp bite. Aged two years in oak casks it has a distinct bright character, light straw colour and lemony flavour. A blend of two and three year old, oak cask matured, bitter sweet and sharp apples gives a full balanced cider with a rich base, an oaky middle and a crisp top. Sweet and juicy blackcurrants are blended with traditional cider to create a refreshing, thirst quenching drink with a depth of colour and a light floral aroma. Traditional cider mixed with a flavoursome blend of sweet, citrus lemons and aromatic limes to create a wonderfully refreshing and thirst quenching cider. The exotic taste of mango is fused with traditional cider to produce the perfect balance between sweetness and acidity. Juicy sweet oranges, exotic pineapples, crisp refreshing cider apples are bursting through this cider. Traditional cider combined with delicious strawberries to create a craft cider with a hint of summer. Golden in colour with a slight red hue, this cider has a gentle soft fruit aroma, that delivers a delicate sweetness. Single variety Kent grown Jazz apple made by hand in the old fashioned way. Medium dry fermented pear juice. CAMRA cider of the year 2007 and 2015. A real classic, beautifully balanced prize-winning Devon cider.